Exquisite and uniquely hand crafted by the Master craftsmen and women of Kashmir. If you are searching for the REAL Pashmina, please be assured that these pashminas have been lovingly hand crafted by the Master craftsmen and women of Kashmir. 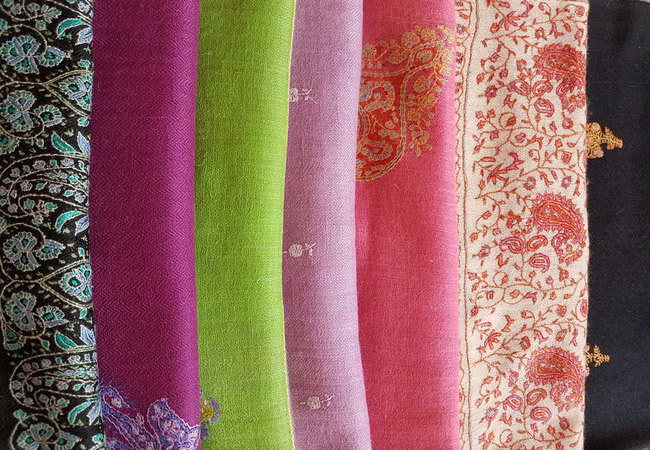 Only the finest quality pashmina is hand spun into fine threads. Pashmina is combed from the coat of the Lena Rama (Pashmina) goat found in the Chantang area of Ladakh. Every item has been carefully selected or commissioned by 'Door to the Himalayas' ensuring the finest quality produced by the Master craftsmen is presented to our most discerning customers. Please note each item is unique and prices vary according to size and detail, remember to select an item before placing your order.